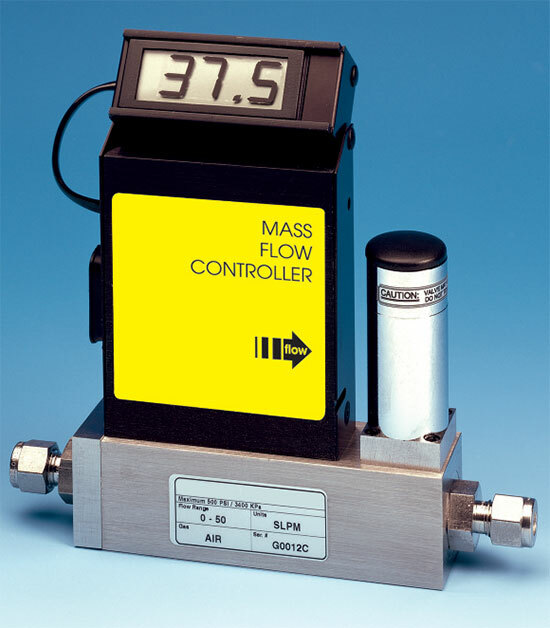 The Series A810 electronic mass flow controllers are compact, self-contained units designed to indicate and control a set flow rate of gas. They are unaffected by temperature and pressure variations within specified limits. The mechanical layout of the design includes an LCD readout built into the top of the transducer. This readout module is tiltable over 90 degrees to provide optimum reading comfort. The readout is connected by a standard modular plug, and is readily removable and extended for remote reading installations. Units are available in aluminum or stainless steel. Maximum operating pressure – 1000 psig. Leak integrity 1 X 10-9 sccm helium. 0-5 VDC or 4-20mA signals. Built-in tiltable readout display in some models. Standard calibration is in horizontal position. Connections: 1/4" compression fittings. Higher flow rate units may have different connections.